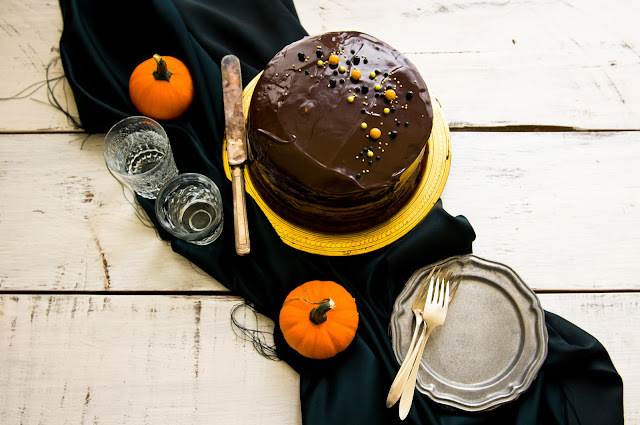 Desserts for Breakfast: Pumpkin S'mores Cake, and a Blogrthday! Well! This little slice of the internets is turning two! Two! That's two years since the first recipe, vegan chocolate pumpkin cupcakes, went live on the air. That's roughly 170+ recipes--one a week--since then. That's roughly 200+ posts, and countless pounds of butter, chocolate, sugar, cream, and flour. To me, this is amazing. I can hardly believe it. I've never been able to keep any consistent journals before in my life. In grade school, I was always the first to slack off when teachers gave "journal" assignments over the summer or holidays. Currently, in my old room at my parents' house sit stacks upon stacks of partially-used journals (much to my mom's great frustration), in which I wrote a page or two before giving up and starting anew. Sure, I have a personal blog that's been on the web since the start of college, but often long months and stretches of time go by without me even logging in at all (and I only really ever log in to have a place to complain and vent). So really, the fact that desserts for breakfast has been here, week after week, for two long years... I have no idea how this has happened! But really, it's amazing, and exciting, and I honestly think that you all, readers and blogging community friends, are to thank for whatever has kept this blog going all this time. Two years ago, I was extremely lonely, having (relatively) recently moved to a new town and situation. 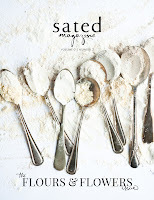 I so clearly remember standing in my kitchen, woefully longing for a group of friends who were like-minded and understood my baking obsessions and not knowing where in the world I could find such people, though I knew such people must exist! And by some sheer luck, two years later, here I am now, with so many of you. :-D Wonderful! To celebrate this two-year blogrthday (aka: "blogiversary"), I decided to make a play on the blog's first recipe and remix it with one of the darling desserts of the food blogosphere for a pumpkin s'mores cake. The cake layers are super moist and airy spiced pumpkin-graham cracker chiffon (made with homemade graham crackers, of course! ), alternating with generous mounds of sweet, fluffy toasted marshmallow frosting and a thick glaze of deep, dark chocolate ganache. This is one of those sticky, melty, and ever so slightly gooey constructions that you end up licking clean off the plate! These past two years have been absolutely wonderful for me, packed with tons of new experiences and friends and things to learn and foods to eat/bake on the blogosphere. So, thank you! for making it so wonderful and fantastic, and here's wishing us plenty more butter, flour, chocolate, cream, and sugar to come. 1. Preheat oven to 325 degrees F. Prepare three 8" spring-form cake pans. Do not grease. If desired, use even-bake strips. 2. Sift together the ground graham crackers, sugar, baking powder, salt, and spices. Set aside. 3. Whisk to combine the egg yolks, pumpkin puree, oil, and vanilla extract together. Add in the dry ingredients and stir together. 4. In a separate bowl, beat the egg whites to soft peaks, gradually adding the remaining 2 Tbspn sugar. 5. Stir 1/3 of the egg whites into the batter, then fold in the remaining egg whites just until there are no streaks left. 6. Divide the batter amongst the three cake pans and bake for 40-50 minutes, until a toothpick inserted in the center of the cake comes out cleanly. Remove from oven and invert the pans to cool upside-down on wire racks. 7. When cool, run a knife around the edge of the cake pans to remove the cakes. 1. In a double boiler over boiling water, combine the egg whites, sugar, corn syrup, water, cream of tartar, and salt. Whisk for 6-8 minutes over heat, until a meringue forms. 2. Remove from heat and continue whisking, gradually adding in the vanilla extract, until the meringue is cool and very thick. 3. Spread the meringue in a thin layer on a baking sheet and, using a blow torch or under a hot broiler, toast the surface of the meringue until brown. Return to the bowl and whisk until cool. Use immediately. 1. Prepare the chopped chocolate in a heat-proof bowl. 2. Cook the heavy cream and butter over medium high heat until a simmer. Remove from heat and pour over prepared chocolate. Stir until no streaks remain. Use immediately. 1. 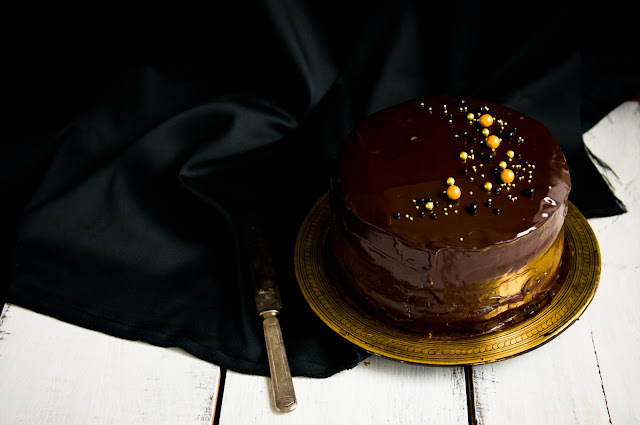 Spread each cake layer with dark chocolate ganache. 2. Stack the cakes with a generous layer of toasted marshmallow frosting in between. 3. 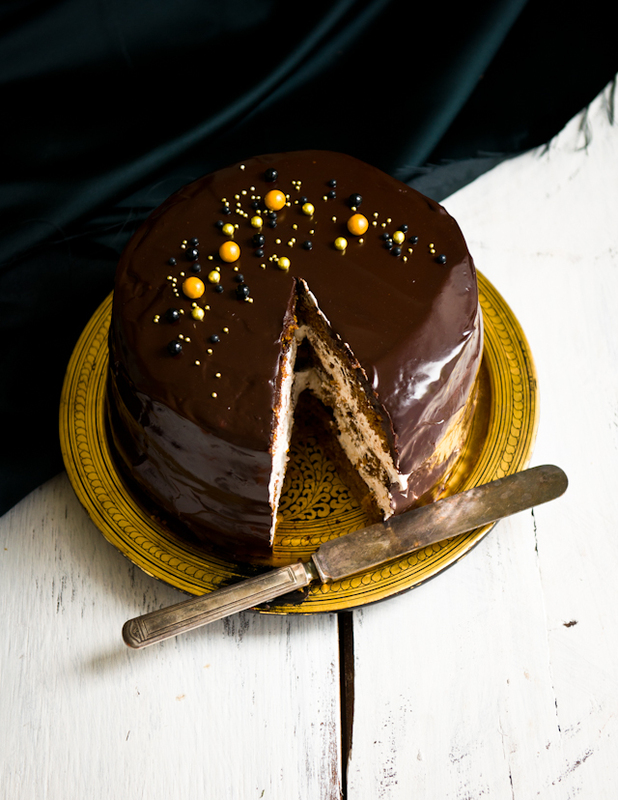 Spread a thin crumb coat of ganache over the cake and let cool briefly before glazing with the remaining dark chocolate. Reheat the dark chocolate if necessary to maintain a pouring consistency. Top with nonpareils. Serve immediately. cake recipe loosely adapted from Baking Bites. toasted marshmallow filling loosely adapted from Joy of Cooking. Some places just get more special with every year! Happy blogrthday. Thank GOODNESS for you, bless you. And bless this cake, and bless my tummy when I eat the entire thing! Happy happy birthday!! Here's to many more years of desserts for breakfasts. Congratulations on your blogiversary! I'm only a relatively new reader, but look forward to reading posts (hopefully) for the next two years to come :-) This cake looks absolutely gorgeous and toasted marshmallow frosting is probably one of the most incredible things I've ever heard of. Amazing! When you tweeted about the 7-minute frosting the other day, I never imagined it to be the toasted marshmallow bit of a s'mores cake. Happy 2nd and many more to come! Happy blogrthday. Looks too good to be eaten, but given a chance I'll demolish it! WOW. This recipe is a masterpiece. TOTALLY blogrthday worthy. Thank you for sharing! Happy 2 years! Love reading and gawking at your posts every week. Especially this cake. Yum! happy blogiversary ! 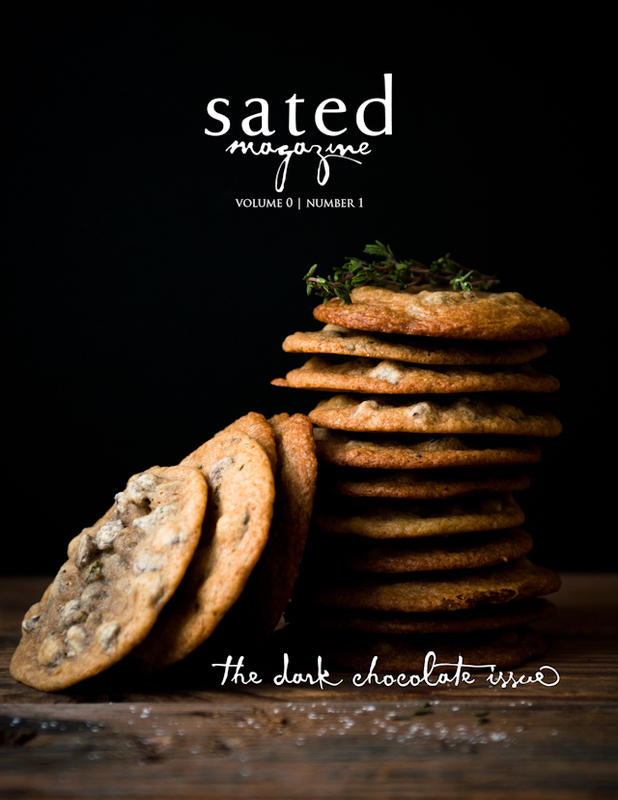 i'm so happy you exist to provide the most delicious recipes... i mean, come on! pumpkin s'mores cake ?!?!? Mmm mm mmm, this looks too good to pass up, I'll just have to try this out! This sounds so incredibly delicious! Congratulations on two delicious years! And thank you for providing us with such gorgeous, mouthwatering photography. Congratulations Stephanie! Happy blogiversary! Needless to say I admire your blog, your photos, your yummie desserts! :) Keep up the good work! So sorry about that last comment! I just wanted to say happy blogrthday and I love your photography. 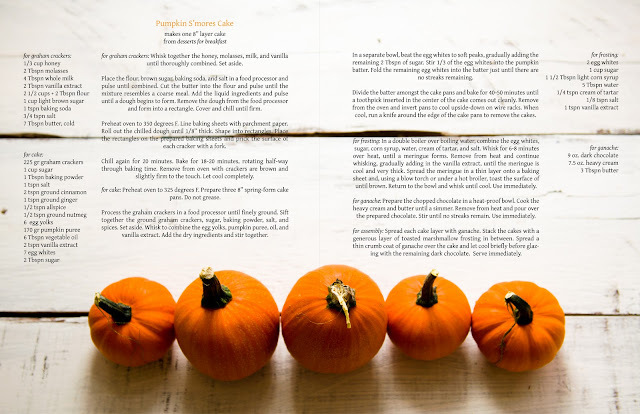 The pumpkins are such an adorable idea for a recipe card. Looks very nice! I bet it tastes great too! Happy Blogrthday! Reading your post gives me hope for my blog, which is still pretty new. 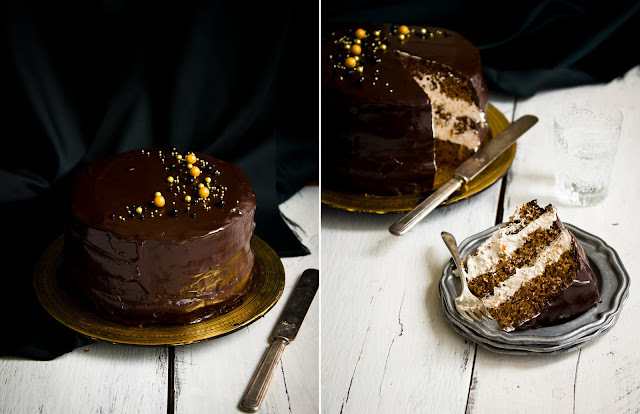 Your cake is mouthwatering and I love the photography! BEST THING FOR FALL THIS YEAR! What a sensational looking cake! Happy Blog Birthday Steph! Now I need that slice! Your blog is so nice, happy blogiversary !!!! 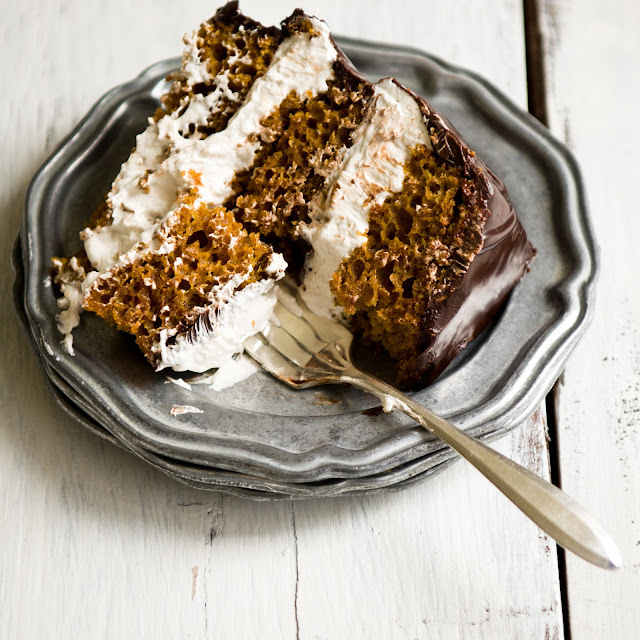 Could you use marshmallow cream in this recipe instead of the toasted marshmallow filling? Happy blogrthday ;p and that cake looks incredible!! Congrats!! The texture of this cake looks LOVELY! I'm not sure, actually, since I've never worked with marshmallow cream. I would worry that it might not be stiff enough to support the cake layers? Sweetapolita actually has a marshmallow fluff + toasted marshmallow frosting you could try instead: http://sweetapolita.com/2011/02/campfire-delight-6-layer-rich-chocolate-malted-toasted-marshmallow-cake/ It looks good! Happy Blog Birthday! A few months ago I made your black forest cake (the one with the chocolate trees) for a gathering and someone recognized it as your post! It was Anita from Braised Anatomy :) Turned out great. Happy blogrthday!!! Your cake looks AMAZING!!! Going to give it a try over the weekend! Congrats on 2 years of hard work! Where on earth did you get those gorgeous nonpareils? I love the way you've used them. oh my gah... i cannot even handle a pumpkin smores cake. i'd, like, eat the whole thing! This looks delicious! 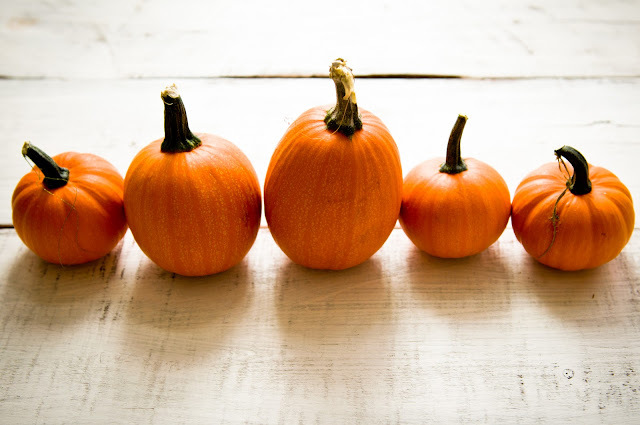 I love how you introduced summer s'mores to fall pumpkins, brillant. Happy Blogirversary. Thank you for a wonderful recipe! You were my blog fav of the week @ http://www.ourlittlegems.com/ ! Happy Weekend! happy happy blog birthday!! so glad you decided to start posting recipes.